You live in the moment. You don't see the future as a fixed destination. Instead, you see it as a place that you create out of the choices that you make right now. And so you discover your future one choice at a time. This doesn't mean that you don't have plans. You probably do. But this theme of Adaptability does enable you to respond willingly to the demands of the moment even if they pull you away from your plans. Unlike some, you don't resent sudden requests or unforeseen detours. You expect them. They are inevitable. Indeed, on some level you actually look forward to them. You are, at heart, a very flexible person who can stay productive when the demands of work are pulling you in many different directions at once. Seek roles in which success depends upon responding to constantly changing circumstances. Consider career areas such as journalism, live television production, emergency healthcare, and customer service. In roles of this type, the best react the fastest and stay level headed. Fine-tune your responsiveness. For example, if your job demands unanticipated travel, learn how to pack and leave in 30 minutes. If your work pressure comes in unpredictable spurts, practice the first three moves you will always make when the pressure hits. During times when the pressure is on, help your colleagues find productive ways to relieve the pressure and therefore make progress. You can be the spark that "unfreezes" them. Cultivate your reputation as a calm and reassuring person when others become upset by daily events. Never apologize for your spontaneity. On the contrary, help others realize how many experiences might be missed if you don't seize the moment now. Avoid roles that demand structure and predictability. These roles will quickly frustrate you, make you feel inadequate, and stifle your independence. Look to others for planning. People who strong in themes such as Focus, Strategic, or Belief can help you shape your longer-term goals, leaving you to excel at dealing with the day-to-day variations. 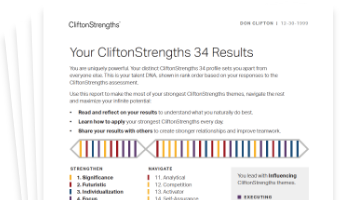 See how Adaptability shows in your CliftonStrengths results -- discover All 34 CliftonStrengths Themes today!